NOTE: This is preview material and is subject to change. Information listed here is good as of 2/5/2015. From https://portal.office.com/Home you will see it in the middle of the page. Signing up for Power BI from http://www.powerbi.com causes you to sign up for the Public Preview. 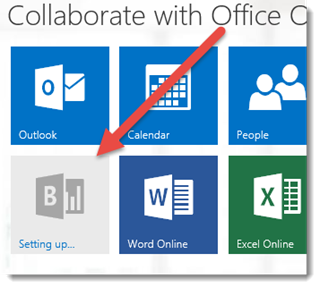 The icon within the Office 365 App Grid is meant for the existing services which is Power BI for Office 365 and requires a subscription to that SKU. As a result, this icon will always show “Setting up…”. It is not a problem with the actual service. You can still use the Public Preview. To do that, go to https://app.powerbi.com and sign in. 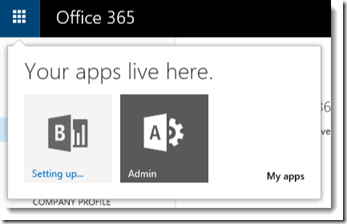 If you do have access to the O365 Admin Portal, you can verify what you have by looking at your licenses. If you see Microsoft Power BI, and it shows 1,000,000 licenses, that is for the Free/Preview offering. 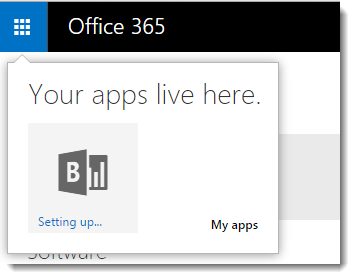 If this is all you see for Power BI, then you should expect the Power BI Icon in the O365 App Grid to always show “Setting up…”. For people that are just using Power BI and not doing anything else, you probably won’t notice this at all. However, there are other situations where you will see this. If you only have Power BI, but you want to take over the domain from a Tenant perspective for your organization, you can go through an IT Admin takeover process via the O365 Portal. This will end up showing you the Admin icon in addition to the Power BI Icon. 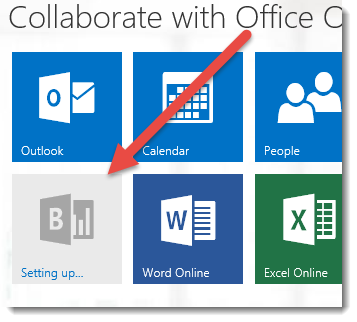 If you already have an existing O365 Subscription, you will see the O365 Grid and will see these icons/tiles. You may see the Power BI Icon present and in the “Setting up…” state. If you have signed up for just OneDrive for Business, this will cause a subscription to be present. 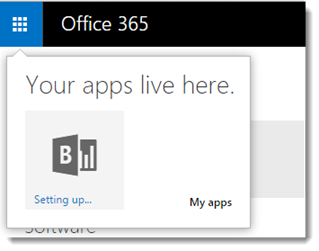 When you are in OneDrive, you will see the O365 App Grid and may see the Power BI Icon present in the “Setting up…” state.